North Africa focused oil and gas company SDX Energy Inc announced “significant” gas discovery in its LNB-1 well on the Lalla Mimouna permit in northwestern Morocco. The company also announced that it has unearthed two new discoveries, one stands out as it is unlike the company’s other recent discoveries onshore Morocco. the company said in a statement the gas shows in this section contained heavier hydrocarbon components throughout which is indicative of a thermogenic hydrocarbon source rock, and these types of shows have not been seen to date in other parts of the basin. “We are very excited about the results of this exploration well. It was a higher risk exploration prospect than previous drilling in Sebou, as it was a sequence that had not been previously penetrated in a similar structural location. We had anticipated a higher-pressure section, based upon offset drilling in the area, but the actual pressures encountered, the thickness of the section, and the type and amount of shows significantly exceeded our expectations,” SDX CEO Paul Welch said in a comment. “We are currently in the early planning phases of determining how best to complete and test this section. The estimated volume potential is very encouraging and I look forward to updating the market further on our activities in due course. Meanwhile, we have one more exploration well to drill on the permit in this campaign and I am looking forward to some more positive results based upon our success in LNB-1,” he added. 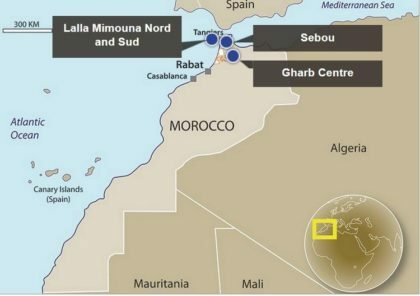 Last Month, the same company announced that a gas discovery has been made at its SAH-2 well on the Sebou onshore permit in North-Western Morocco near the Atlantic city of Kenitra.